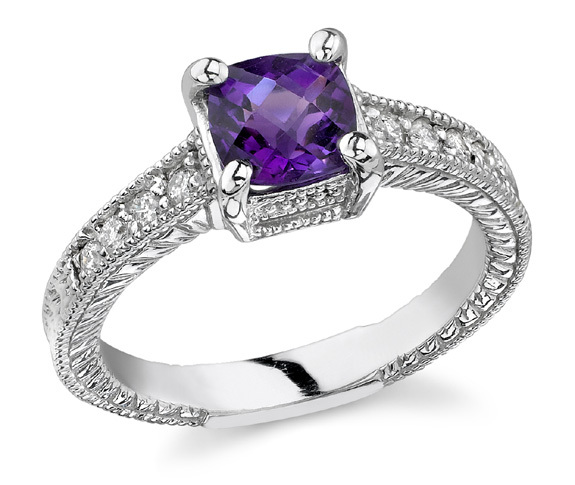 The rich deep violet of the amethyst has always been associated with royalty and you'll feel like a princess with this enchanting art deco style ring on your finger that is reminiscent of a jeweled crown from a fairytale era. Flanked by four diamonds on each side for a total of eight diamonds with a total diamond weight of 0.16 Carats in high quality H-I Color, SI Clarity. The stunning square cushion-cut checkerboard amethyst in this piece is carefully set into solid 14k white gold, for a total center gemstone weight of 1.25 Carats. The amethyst gem measures 7mm. We guarantee our Art Deco Diamond and Amethyst Ring, 14K White Gold to be high quality, authentic jewelry, as described above.